While the newspapers today are again plastered with negative stories about the MTA’s budget crisis, I found, this evening, a glimmer of hope in the New York City subway system. On my way back to Brooklyn from the Upper West Side, I came across crews in the 96th St. subway station preparing new signs promising expanding service. 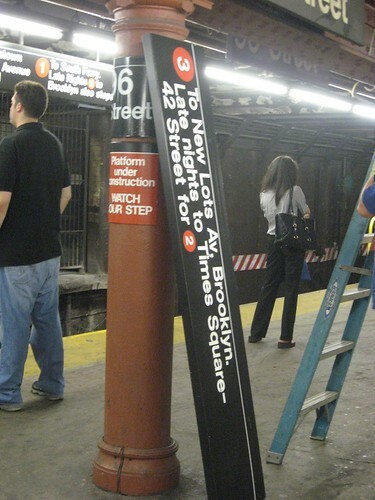 The new signs, seen here resting against a pillar at 11:32 p.m. last night, promise added service. The 3 will now run all the time. During late nights from 11:30 p.m. to 6 a.m. when the 3 used to lie dormant, trains will run from 148th St. to Times Square with connection available to the 2 train continuing on to Brooklyn. This is but one change designed to increase service along lines nearing or at capacity. Oftentimes, these signage changes take place when no one is watching. Mysteriously and magically, the signs change, and the trains run at different times over different routes. Tonight, I was watching, and soon â€” perhaps later today? â€” the trains will run on new and better schedules. As the subways and the MTA’s budget woes are about to face the gauntlet of public officials, it’s always fascinating to see the system changing and comforting to see the MTA working to improve service in dark days. Enjoy it will you can; who knows what tomorrow, next month or next year will bring. Does the 3 run express or local late nights? If it’s turning around at Times Square, that suggests express. Any word on whether the G will be extended to Church Ave? The revised service hasn’t started yet, but the 3 will be running express at all times. The revised G service will go to Church Ave, but they haven’t announced when that will happen.